Every since I set out to write my Chinese epic, the Jasmine Wars, I’ve wanted to use a modified version of a famous communist propaganda poster for the cover. You see it in the corner there on the left. 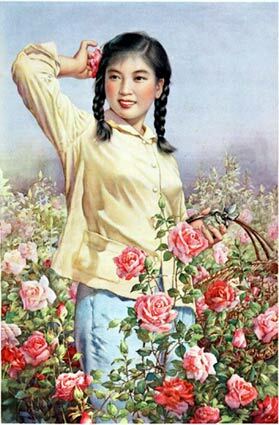 The communists used it in the Hundred Flowers Campaign, an ambitious attempt to open up and allow criticism of the Party after they’d cemented control following the Chinese Civil War. The phrase came from a speech by Chairman Mao where he said, “let a hundred flowers bloom, a hundred schools of thought contend.” Most historians feel that it was nothing but a cynical attempt to draw dissidents out into the open so they could annihilate them. As the liberalization campaign collapsed, the communists responded as they usually did: with a brutal purge, executing prominent intellectuals and jailing 520,000 people in re-education camps known as “reform through labor” or Laogai. Spotty record keeping in China at the time probably meant it was much, much higher, somewhere in the millions. While it’s certainly easy to make the argument that Mao just wanted to “lure the snakes out of the hole” the reality was more nuanced and in many ways more sinister. According to the definitive biography of Mao by Phillip Short, Mao: A Life, the Charmain truly hoped to wed “totalitarianism with democratic checks and balances.” It was his idea and he pushed it forward against great resistance in the upper echelon of the Party. In a classic display of the Asian principle of Honne and Tatemae, the top cadres publicly agreed, but privately grumbled. Those are Japanese words, but they have roots in many Asian societies. Honne means a person’s true desires and feelings and Tatemae literally translates to “facade,” in other words it’s the face we show in public. Most leaders in the Party at the time were hardened war veterans, who’d endured incredible hardships, such as the Long March, part of the communists’ founding myth, where the Red army fled over 6000 miles on foot, an average of 17 miles a day through the mountains, for two years, fighting over two hundred battles and going from a force of hundreds of thousands down to 5000, a feat that no other modern army had every suffered. These iron men favored discipline over intellectual debate. Mao pressed forward anyway. Nevertheless, most of the intellectuals of the time remained silent. They didn’t trust the communists and rightly so, having suffered numerous purges early, exemplified by the smearing and eventual execution of writer Wang Shiwei, along with millions upon millions of party leaders, police, intellectuals, students and peasants both during and after the Chinese Civil War against the Nationalists. But slowly, slowly, the people opened up. Criticisms of the Party became vitriolic. Democracy leagues formed at the universities. Students criticized the leaders for pretending to represent “the people” when in fact they were nothing but the feudal lords of old transmuted into a new form, an aristocracy separate from the people, with special treatment and privileges. At first, Mao continued to encourage the dissent in public, but in private he began to express doubts with talk of pulling out the “poisonous weeds” of dissent. Phillip Short goes further, suggesting that Mao indeed hoped that he could let people talk freely. He gave a speech saying “if you want to grow only [fragrant flowers] and not weeds, it can’t be done…To ban all weeds and stop them growing, is that possible? The reality is that it is not. They still grow.” At the time, intellectuals dared to hope. “Robert Loh, a Shanghai businessman, remembered ‘I was in a daze. After Mao’s speech anything seemed possible. For the first time in many years, I allowed myself to hope.’ But many remained wary. As the Chinese proverb goes “a man bitten by a snake is afraid of a piece of rope. '” And yet for years, Mao kept encouraging people to open up and speak freely. This is not unlike the way the Party currently uses social media, allowing people to criticize leaders so they can keep tabs on them but censoring them if they try to organize. More complex forces were at work. The collectivization campaign that nationalized all private industry after the war, wedding everything to the party, had decimated the rich and educated and crashed the economy. They wiped out the landlords from the feudal era, killing them off in public show trials, condemning them for being capitalists, the poor peasants shooting, hanging or beating them to death. The problem is it’s pretty hard to build a society with no smart people, no engineers, no doctors, no teachers or students. Mao needed to win those people back if he ever hoped to build a prosperous society. Intellectuals are by nature critical. As my greatest teacher, Mr. Dawson, taught me, “critical thinking” represents the essence of all education. They say every cynic is an idealist. At his core, Mao was certainly one. In his younger days, he reacted to absolute horrors in his society. The life of a Chinese person at the turn of the century echoed the way GRR Martin described medieval life: “nasty, brutish and short.” In the early years, he had the enthusiastic backing of the peasants, who eked out a pitiful existence, living their entire lives under the thumb of the “landlords,” who owned everything. Landlords are a misnomer. They were actually “feudal lords” who owned the lives of their peasants completely. They used private military forces and police to crush dissent. They often collected taxes of up to 90% decades in advance from their subjects. Mao wanted to set them free, talking opening of democratic elections and working together. Mao and Soviets of old Russia railed against “capitalism” and “imperialism” because they saw its effects in the lives of the everyman, but these were not the capitalism we know today. Rather we should better call it mercantilism and colonialism, brutal early offshoots of capitalism that still retained most of the power in the hands of the rich. We could also call that a plutocracy. And “imperialism” was really democratic countries like America propping up dictators the world over when it served our interests. Protesting Americans today talk about the 1% and the 99% but the past shows us what that looked like in real life. Back at the turn of the century and for thousands of years before that, the 1% owned everything and the peoples’ very lives were theirs to play with at a whim. No middle class existed. No concept of individual will or rights mattered to anyone in power at all. Instead, they killed and controlled as they saw fit. Unfortunately, the war stripped Mao of much of his humanity, killing off at least four of his children and hardening him against anything human, especially weakness. He also ended up discovering what every communist discovers: communism can only be installed and maintained with force. It’s incompatible with the individualism of democracy, where everyone freely expresses their own ideas and determines their own destiny. As Hayek noted in his famous book The Road to Serfdom, “socialism can’t be installed except by methods most socialists find repugnant,” in other words vicious violence and repression. In a tacit admission of the truth Mao admitted the root of the problem was that, “the peasants want freedom but we want socialism.” In other words, we’ll give it to them whether they want it or not. Something even more disturbing lays hidden beneath the surface as we examine the secrets of the Mao era. It demonstrates clearly a theory from my enlightenment days: belief systems cause more human pain and suffering on Earth than anything else. The wild-eyed communist idealists hoped that they could enshrine the better angels of our nature in steel. They promised Utopia, but the problem with Utopia is that no two people can agree on what it really means. Everyone has different ideas. In the end, all belief systems prove false. Suddenly the Utopia falls apart because nobody can come to a consensus on what that perfect society looks like. It inevitably comes to mean “one man’s ideal,” the powerful man who can force his ideas in through violence, and everyone who disagrees needs to die to protect that future that ends up further and further out of reach. In the end, it never comes. The ends don’t justify the means. All you get is a lot of unnecessary death and suffering. After years of war, Mao so believed his own ideas that he could not even conceive that when people were allowed to think for themselves that they would think what they wanted not what he wanted. This is the flaw of all dictators, the mote in their eye. They believe that people will come to their conclusions, but it never works out that way. Mao thought that when he exposed people to capitalism and western ideas that they’d naturally see it as a horror, just as he did. He believed it was self-evident. Like all idealists he believed that if people just had a chance they would selflessly give up everything they had and work together. But people are contradictions. We want to help others and ourselves. We want to share but we also want private things. And left to our own choices, people always want freedom, the freedom to determine their own lives, their own ideas and actions. When you look closely, it’s easy to see the truth in life. As Jesus said, “by their fruit you will recognize them.” Many scholars narrowly ascribe this to mean “false prophets” but it can easily be applied to any leader or person of power in history. Never listen to what a man says. Pay attention to what he does and more importantly focus on the results of those actions. The contradictions in men come from what they say, but the fruit of their actions always tells the truth. If a man advocates freedom with his words but brutally suppresses those who disagree with him, the only truth is that he is a psychopath and an evil force in the world. If a man promises Utopia but only delivers horror, then he is a “false prophet” as Mao turned out to be, a man who helped a society throw off the yoke of an old regime, only to seize power himself and bring about something far, far worse. The warlords and feudal masters never left China, they just transformed into something else.